Oglesby is captivating as the accomplished and self-assured Genesis and Freelong Jr. wins our hearts as her adoring and affectionate partner. Both are professionals in their thirties. Genesis is an award winning elementary school principal and Rashad is a firefighter and single father to a daughter Genesis adores. 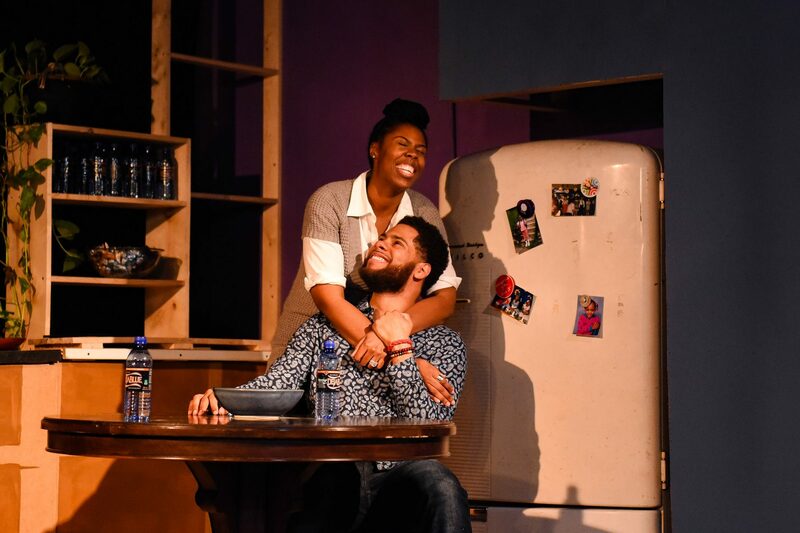 The couple is on the verge of happily-ever-after but a complication arises when Rashad surprises her with tickets to a star studded concert organized by a (fictional) Chicago rapper, Kashif. Genesis refuses to attend because of an incident from Kashif’s college days. This celebrated celebrity is not the pillar of the community he pretends to be, she asserts. Their conversation about how to respond to the confirmed and alleged transgressions of high profile men echoes our current national dialogue, while focusing specifically on the complications that arise when race is a factor in this equation. Genesis brings up Floyd Mayweather, a beloved fighter who has a history of domestic violence but is idolized by her young students. When a boy tells her he aspires to be as great as Floyd she is itching to tell the truth but is afraid of tearing down his hero. Later, in a moment of hyperbolic exasperation Rashad suggests that Kashif’s good deeds might cancel out any ancient rumors about his character. He dismisses the issue as not “worth marching” over. The play invites us to consider the daily compromises and assumptions that have resulted in a culture of silencing and double standards. It isn’t enough, Genesis counters, to condemn violence against women in your family, if you’re willing to excuse violence against strangers. Ultimately, The Light is a love letter to black women. A love letter proclaiming black women are worth marching for, their voices must be heard and perhaps most importantly, they have a right to express vulnerability, a privilege they have historically often been denied. Genesis testifies how this imperative to be unceasingly strong can be toxic. When women’s trauma is ignored they are re-victimized by society’s dismissal of their humanity. As we’ve seen in the zeitgeist of #metoo this is especially likely to happen to women of color even when they are leaders in breaking the silence. Webb challenges her audience to examine their own level of tolerance for misogyny and sexual violence from our public figures. As we watch Rashad discovering his own blind spots we too can recognize how our values can fall out of alignment with our actions, whether it’s through the seemingly benign consumption of cultural products or whether it’s through limiting our compassion to those near and dear. It is clear that Webb’s project of spreading radical love has inspired the rest of the show’s creative team. Genesis’s Hyde Park condo fills three quarters of the space and the specificity of its design elements draw us further into her world. The detailed set features original artwork by John Wilson, eye-catching portraits of Genesis’ idols like Nina Simone. And Toma Langston’s direction keeps this cerebral discussion play dynamic and full of energy. The Light is the thirtieth and final show to be produced by The New Colony’s outgoing co-Artistic Directors, Andrew Hobgood and Evan Linder. They exit with a play that shows us not only how things are, but also hopefully suggests how things might yet be. BIAS ALERT: I am a member of TNC’s 2017 Writer’s Room. Rescripted co-founder, Regina Victor, served as dramaturg on this production. Victor did not edit this piece nor view it until publication.